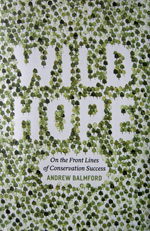 Andrew Balmford’s theme is conservation success. After briefly reviewing the current depressing state of worldwide conservation, he points out that, although the glass is half empty, it is also half full, illustrating this by describing a variety of situations he has visited around the world which show that conservation projects can be successful, despite setbacks and failures, and give hope for the future. These vary widely in scale and methods – from a small community in Ecuador, to large-scale alien plant eradication in South Africa, from armed guards to political action to payments for ecosystem services. Though not a specifically Christian book, I feel it chimes well with the ethos of A Rocha, in its emphasis on community involvement, in the author’s sense of wonder, and the linking of conservation with the eradication of poverty and even with good business practice. Find this book on Amazon.co.uk here.